His biggest claim to fame as an amateur was that he lost to Shane Lowry in the 2007 Irish Close final at Cork Golf Club. 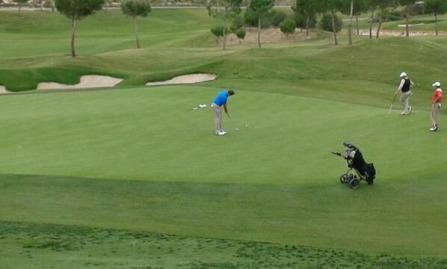 But afer making an eagle three at the ninth and four birdies in a five under 66, he’s just a shot behind leader Emilio Cuartero Blanco on 11 under par and chasing his maiden tour win. Cuartero shot a second successive 65 at Galgorm Castle to lead by one shot on 12 under par at the halfway point of the Northern Ireland Open in Association with Sphere Global and Ulster Bank. Turner has only recently returned from a long-term back injury (he also had hip trouble) but has found form in front of the Irish crowds and is keen to make up for lost time. Cuartero, 24, is bidding to become Spain’s third European Challenge Tour winner this season after Nacho Elvira and Borja Virto Astudillo. Northern Ireland’s own Gareth Shaw gave the home fans something to cheer about by firing the low round of the week so far, a seven under par 64 helping him to make the cut after a shaky opening round of 73. But Castledawson’s Chris Selfridge trumped Shaw to be the leading Northern Irishman heading into the weekend after the 23 year old carded a five under 66 to sit four off the pace on eight under. Tournament Ambassador Michael Hoey birdied two of his final three holes but his two under par total that was not enough to make the cut, missing by one shot. Just seven of the 23 Irish entrants made the cut with Simon Thornton (69) seven under and Peter Lawrie (70) four under with Shaw and Niall Kearney (69) while Headfort’s Brian Casey made it right on the three under mark after a 69. 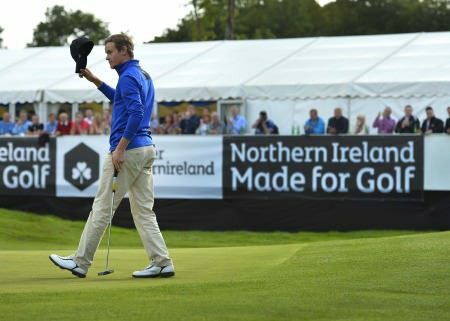 Asian Tour, Challenge Tour, European Tour, Europro Tour, EPD Tour, Irish Region or amateur - Ireland's menagerie of pro golfers got off to a generally positive start in the Northern Ireland Open in Association with Sphere Global and Ulster Bank at Galgorm Castle. Muskerry’s Niall Turner shares the lead heading into the final round of the Northern Ireland Open in Association with Sphere Global and Ulster Bank after a three under par third round 68 at Galgorm Castle moved him to the summit alongside second round leader Emilio Cuartero Blanco. Michael Hoey is lurking dangerously as he tracks his sixth European Tour win but perhaps even more impressive was Brian Casey’s back nine charge in the M2M Russian Open. Daan Huizing. Picture © Press Eye Belfast. Daan Huizing will take a six shot lead into the final round of the Northern Ireland Open Challenge presented by Clannah and XJET after a flawless third round of five under par 66 saw him soar clear of the field at the Galgorm Castle Golf Club, writes the European Challenge Tour.